The salinity difference between fresh water and salt water could be a source of renewable energy. However, power yields from existing techniques are not high enough to make them viable. A solution to this problem may now have been found. A team led by physicists at the Institut Lumière Matière in Lyon (CNRS / Université Claude Bernard Lyon 1), in collaboration with the Institut Néel (CNRS), has discovered a new means of harnessing this energy: osmotic flow through boron nitride nanotubes generates huge electric currents, with 1,000 times the efficiency of any previous system. 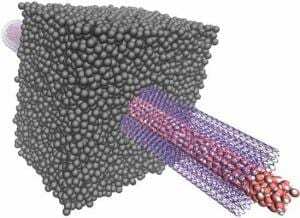 To achieve this result, the researchers developed a highly novel experimental device that enabled them, for the first time, to study osmotic fluid transport through a single nanotube. Their findings are published in the 28 February issue of Nature. Concentrated at the mouths of rivers, the Earth’s osmotic energy potential has a theoretical capacity of at least 1 terawatt — the equivalent of 1,000 nuclear reactors. However, the technologies available for harnessing this energy are relatively inefficient, producing only about 3 watts per square meter of membrane. Today, a team of physicists at the Institut Lumière Matière in Lyon (CNRS / Université Claude Bernard Lyon 1), in collaboration with the Institut Néel (CNRS), may have found a solution to overcome this obstacle. Their primary goal was to study the dynamics of fluids confined in nanometric spaces, such as nanotubes. Drawing inspiration from biology and cell channel research, they achieved a world first in measuring the osmotic flow through a single nanotube. Their experimental device consisted of an impermeable and electrically insulating membrane pierced by a single hole through which the researchers, using the tip of a scanning tunneling microscope, inserted a boron nitride nanotube with an external diameter of a few dozen nanometers. Two electrodes immersed in the fluid on either side of the nanotube enabled them to measure the electric current passing through the membrane. Using this membrane to separate a salt water reservoir and a fresh water reservoir, the team was able to generate a massive electric current through the nanotube, induced by the strong negative surface charge characteristic of boron nitride nanotubes, which attracts the cations contained in the salt water. The intensity of the current passing through the nanotube was on the order of the nanoampere, more than 1,000 times the yield of the other known techniques for retrieving osmotic energy.